Why don't we offer several kinds of slate colours? 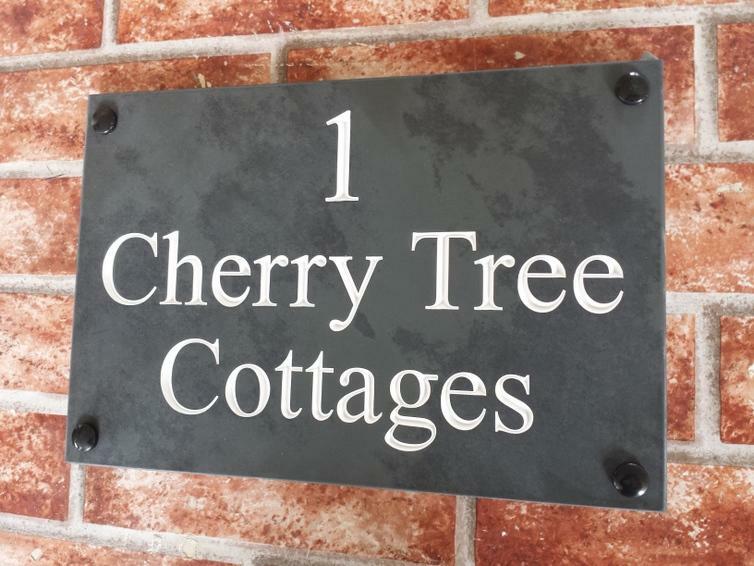 As slate engravers we get asked if we can supply our v-groove signs in a particular kind of colour or from a specific region such as Cumbrian, Cornish Delabole or Welsh slate. We would love to be able to offer different colours of slate such as light grey, green or blue slate but this means having to keep a lot of different slates in stock. To get the stone at the best price we buy it by the 1.5 ton pallet load and this would mean keeping several areas around the workshop clear to stock the cut slate slabs plus a considerable outlay on stock which would shift slower than if we just keep one kind of slate. Therefore we looked into the different types of slate and tested many types with our CNC rounter with the v-carving router bit. Some slates like light grey Indian slate was too soft, wheras Welsh slate was quite hard and could only be bought calibrated to 20mm thick which is too thick and simply wastes slate and weighs more so putting up the price of the signs and also the postage..
We finally opted for honed and 10mm calibrated Brazilian black slate. 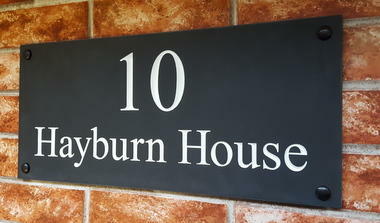 This slate engraves well and is also quite hard, It has lovely natural grains and inclusions which makes each plaque unique even before we engrave the slate house numbers & house names in the stone. The black slate is actually a kind of dark charcoal grey and does not bleach lighter in sunshine like some other coloured slates do. This slate is mined, split and sawn to 10mm thick and honed on one side right at the quarry in Brazil then shipped over to the UK in 1.5 ton pallets. This slate is used a lot in contemporary bathrooms and shower enclosures, kitchens and floors therefore we always can get a ready supply. 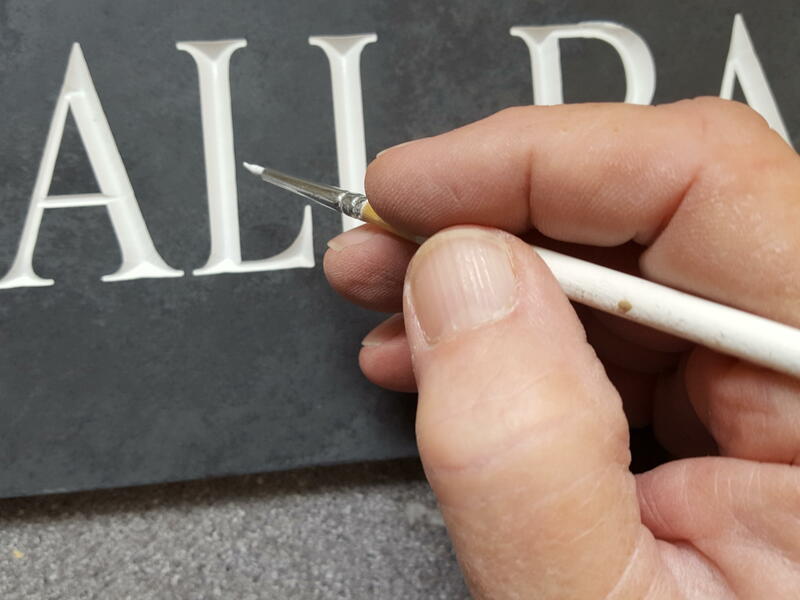 We get the slate in 600mm by 600mm slabs and then cut them to size on our overhead diamond disk cutter before engraving the various popular sized slate plaques. Once engraved the v-grooved number and lettering get 3 coats of hard wearing outdoor enamel paint plus a final coat of protective lacquer. 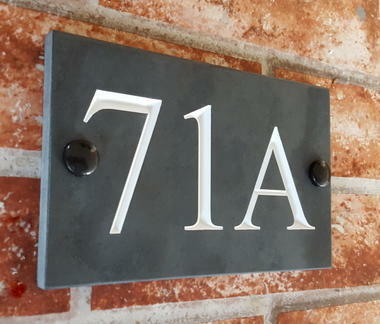 The signs then get fixing holes drilled and then a final polish.